Pdf booklet available here . High on my list of piano duo/duet recordings heard or reviewed in recent years are: Lucille Chung and Alessio Bax’s Brahms, Piazzolla and Stravinsky, well received by Albert Lam; and a bravura programme of Martinů, Stravinsky, Poulenc and Shostakovich from Sanja and Lidija Bizjak, which I reviewed for Download News in 2015. Then the Invencia Duo’s traversal of works by Florent Schmitt, Vol. 3 and Vol. 4 of which I praised in 2013. Immaculately played, all these recitals are proof – if it were needed – that the genre contains music of considerable substance and reward. Enter Martin Anderson’s enterprising Toccata label, well-known for their exploration of less-familiar repertoire; I very much enjoyed their recent set of Krenek concertos, for example. 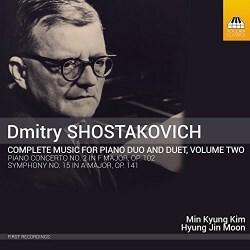 And while Shostakovich isn’t at all peripheral recordings of his piano duos and duets are comparatively rare. Dominy Clements welcomed the first instalment in the Toccata series, remarking that pianists Vicky Yannoula and Jakob Fichert have ‘the measure and spirit’ of these pieces. With a recommendation like that it was hard to resist a quick download; that, in turn, triggered my interest in the follow-up, with pianists Min Kyung Kim and Hyung Jin Moon. 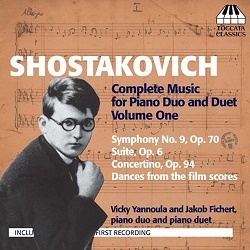 Happily Shostakovich often transcribed his orchestral music for piano four hands, a policy that allowed Party officials to hear the music in advance. Those same apparatchiks had high hopes for the composer’s Ninth Symphony which, in the event, eschewed post-war triumphalism in favour of something inward and quirky. That said, they raised no objections when Shostakovich and Sviatoslav Richter played the duet for them in September 1945. The symphony itself, premiered two months later, was consigned to the deep freeze in 1948, only to be reinstated – along with a number of proscribed pieces – in the post-Stalin thaw. Vicky Yannoula, born in Corfu, and Jakob Fichert, a Londoner who hails from Germany, are new to me. They’re in demand on the solo-piano and chamber circuit in the UK and Europe, and minutes into the symphony it’s not difficult to see why. Their spring-heeled response to the opening Allegro strikes just the right note, that jaunty march both sparkling and spontaneous. The balance is very satisfying and the recording copes well with the challenging dynamics. The sound is also nicely detailed in quieter passages; that’s especially welcome at the start of the Moderato, where clarity and colour really matter. What I like most about this duo is their selfless playing, directed as it is towards purely musical ends. Pacing is ideal, rhythms are well judged and there’s plenty of feeling when required. After that the bright, energetic Presto is a short but bracing ride, and the declamatory power of those big, lingering chords in the Largo is frankly intimidating. The Allegretto certainly has all the dart and deftness one could wish for, but even more important essential shape and focus are preserved throughout; that, in turn, contributes to a compelling sense of structure and purpose. The shorter pieces, mostly for young hands, are very entertaining. If the Waltz from the East German ‘workers’ documentary’ The Song of the Great Rivers (1954) burbles along then the Polka from the Ballet Suite No. 2 is a veritable mill-race. And the rollicking pursuit from the 1940 film The Adventures of Korzinkina? It could be the accompaniment to a Mack Sennett silent. These might seem mere trifles, but they’re superbly crafted and demand serious keyboard skills. The witty little Tarantella and Merry March, both written for the composer’s young son Maxim, are no exception. Next up is the Suite in F sharp minor, written when Shostakovich was just 16. It’s remarkably Romantic at times, with hints of balletic Tchaikovsky in the Prelude: Andantino. The playing has splendid bounce and brio, coupled with a light touch in the Danse fantasque and a wonderful air of introspection in the Nocturne: Andante. The closing bars of the latter glow with a contentment that one doesn’t associate with the older, angst-ridden Shostakovich; indeed, it’s all the more affecting for that. The Finale, with its heady mix of passion and percussive edge, confirms the young composer’s burgeoning talent, not to mention the sheer wizardry of these fine pianists. The Suite and Concertino are both reasonably well represented on record. The latter is a delightful single-movement piece written for Maxim and premiered by him and Alla Maloletkova in 1954. Once again I was struck by this duo’s bold yet intuitive approach to this music. They freewheel through the Concertino’s ever-changing landscapes which, as Malcolm MacDonald points out in his liner-notes, contain pre-echoes of the Piano Concerto No. 2. Such is their way with Shostakovich’s irrepressible rhythms and good-natured asides that I laughed out loud. Really, this is playing of uncommon quality, superbly caught by producer-engineer Michael Ponder. For comparison I turned to a Northern Flowers disc that Nick Barnard reviewed in 2010. Pianists Piotr Laul and Alexander Sandler play the Tarantella and Merry March with commendable enthusiasm, but there’s little of the insight that makes Yannoula and Fichert so engaging in this repertoire. The same goes for the Concertino and Suite, whose comparative shallowness is emphasised by the close, rather brash recording. No contest, but there are alternatives: Sabrina Alberti and Luisi Fanti Zurkowskaja (Dynamic); Aglika Genova and Liuben Dimitrov (CPO); and a disc of Russian piano music with Jeremy Brown and Seta Tanyel (Chandos). Several years and a couple of thousand miles separate the first and second volumes in this Toccata series. The latter is a thoroughly grown-up programme devoted to two-piano versions of Shostakovich’s last symphony, No, 15, and his earlier Piano Concerto No. 2. It seems both are first recordings, which makes this a most intriguing issue. As with Vicky Yannoula and Jakob Fichert, the South Korean pianists Min Kyung Kim and Hyung Jin Moon are unknown to me. That said, their biographical notes speak of solid talent and a growing reputation as performers. They start with the concerto, which Maxim premiered on 10 May 1957 (his 19th birthday). Despite the composer’s well-documented dismissal of the piece it’s fared quite well on record – ArkivMusic list 39 versions in the current catalogue – and it pops up in the concert hall from time to time. As David Fanning points out in his detailed liner-notes the two-piano score is undated, but it was available when Shostakovich père et fils performed it for the USSR Composers’ Union in April 1957. The opening Allegro, framed with admirable precision, is an astonishing reflection of the original. Rhythms are pin sharp and climaxes emerge without strain. Compared with the first volume this one sounds rather bright, but that does suit the glittering displays in the concerto’s outer movements. Any caveats? The pensive Andante could be a little mores seamless, but there’s no doubting the hushed loveliness at the point where, in the orchestral version, the piano steals in for the first time. As before the duo pay close attention to colour and nuance, the high-spirited Allegro dashed off with little sign of blurring or breathlessness. The two-piano version of the symphony was first presented by Mieczysław Weinberg and Boris Tchaikovsky in August 1971 – not 1974, as stated in the booklet. The clarity of both the playing and recording certainly work well in the skittish Allegretto, but I longed for a bit more weight and body which, in turn, would help to heighten contrasts. Still, the South Koreans do capture the music’s distinctive colours, if not its elliptical charm. I also feel momentum flags at times, and with that a degree of shape and cohesion is lost. Apart from the comparatively shallow sound I really missed the sparky musicianship that makes Yannoula and Fichert so memorable in this repertoire. The louring, in-yer-boots character of the second movement is a case in point; the stark outlines are persuasively drawn, but its equivocal content doesn’t always come through. In some ways it seems this duo are striving for effect, and that gives their playing a faintly stilted feel. Make no mistake, these are very accomplished pianists; I just wanted them to dig a little deeper. And despite their alacrity in the penultimate movement – marked Allegretto – their pacing is unaccountably sluggish and some textures are surprisingly diffuse. That’s certainly not what one wants in the sign-off, but that’s what one gets. In short, a promising but flawed release whose failings are magnified in the presence of its illustrious sibling. The first volume deserves to be a Recording of the Month; alas, the follow-up isn’t of the same ilk.